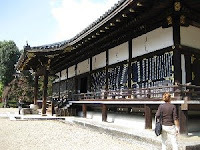 Kyoto is an old city and the old capital in Japan. That's why there are many world heritage sites. And some of them are very famous and popular among not only foreign toursts but Japanese tourists. Kiyomizu temple and Kinkakuji temple are always very crowded, and sometimes you have to wait a little while just to take a simple photo. In Ninnaji temple, you don't worry about waiting to take pictures. When you get off a bus, the old gate will come into your sight. It is not gorgeous, but I am sure you will be impressed. 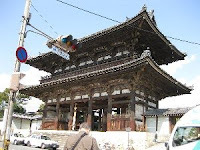 This temple had been relationship to Imperial family untill the end of Edo period.(1868). Imperial family had been sending one of them as a monk to this temple. So, the building of this temple has an imperial style and atmosphere. Walking on the corridor, you may notice it has two tiers. The upper tier is for a person in a higher position, the lower one is for a person in the lower position, and the ones in the lowest had to walk on the ground. A white sand garden opens up in front of you. There is a cherry tree on the left, and a mandarin orange on the right. You can see the same style in the Old Imerial Palace. Go on walking, and the beautiful garden will be waiting for you. Just sit down and view this garden. Spend some time here. In the distance, the Pagoda will join this sight. Pay attention to the window. Usually the buildings in temples have sliding doors and windows. The window of the building in this temple is different from those in other temples. You also see the same ones in the Old Imerial Palace. Yes, this is the Imperial style. Let's take a look at Pagoda in the back. 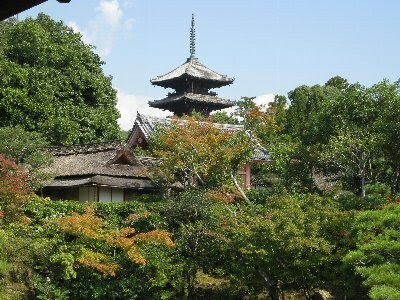 The pagoda was built by the Edo method. What is Edo method? I wil tell it to you at the site. 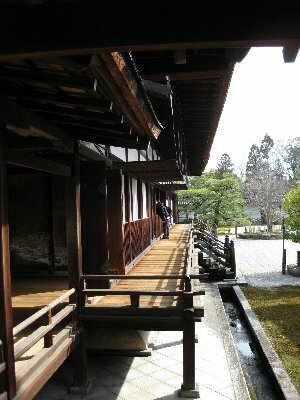 Next to the Pagoda, there is Golden hall ( Kondo). It used to be the main hall of Imperial Palace (so-called Shishinden). It was moved here. As I said above, you can fully enjoy this temple. 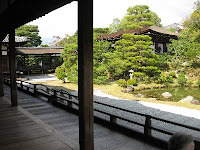 Why don't you put this temple in your visiting list of Kyoto? You should not miss it!One thing must be added. Cherry blossoms in this temple is very famous and full crowded in middle and late April. During this period, you have to see a lot of Japanese tourists and it is very crowded. During the cherry season, they take an additional admission to see cherry blossoms.